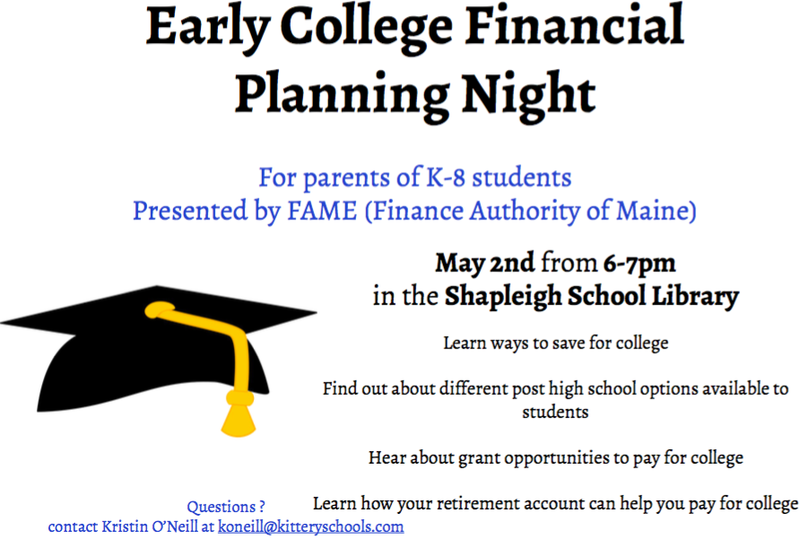 Shapleigh School will host an Early College Financial Planning Night on Tuesday, May 2 from 6-7pm in the library. Designed for parents of K-8 students, this forum is presented by the Finance Authority of Maine (FAME). Learn ways to save for college, find out about different post-high school options available to students, hear about grant opportunities to pay for college, learn how your retirement account can help you pay for college, and more! For questions, contact Shapleigh guidance counselor Kristin O'Neill at koneill@kitteryschools.com.